The small but rapt group of retired educators present at the April 5 luncheon meeting of the Fayette County Retired Teachers Association attentively followed the presentation of Miami Trace Local School District’s superintendent and business manager on the construction progress of the district’s new high school. Currently on target to open in January 2019, the building is the successor to the very first Miami Trace High School, which opened its doors to students in the fall of 1962. Prior to that program, talented singers in Washington High School’s symphonic choir and vocal ensemble provided musical entertainment, directed by Jarod Joseph. The audience was awed by the variety of musical genres and languages demonstrated by the young singers. Pictured with detailed diagrams of the under-construction Miami Trace High School and of the entire centralized campus are (from left) new FCRTA member Richard Owens, MT Business Director Bill Franke, MT Superintendent David Lewis and new FCRTA member Barbara Garringer. https://www.recordherald.com/wp-content/uploads/sites/27/2018/04/web1_20180405_111117.jpgThe small but rapt group of retired educators present at the April 5 luncheon meeting of the Fayette County Retired Teachers Association attentively followed the presentation of Miami Trace Local School District’s superintendent and business manager on the construction progress of the district’s new high school. Currently on target to open in January 2019, the building is the successor to the very first Miami Trace High School, which opened its doors to students in the fall of 1962. Prior to that program, talented singers in Washington High School’s symphonic choir and vocal ensemble provided musical entertainment, directed by Jarod Joseph. The audience was awed by the variety of musical genres and languages demonstrated by the young singers. 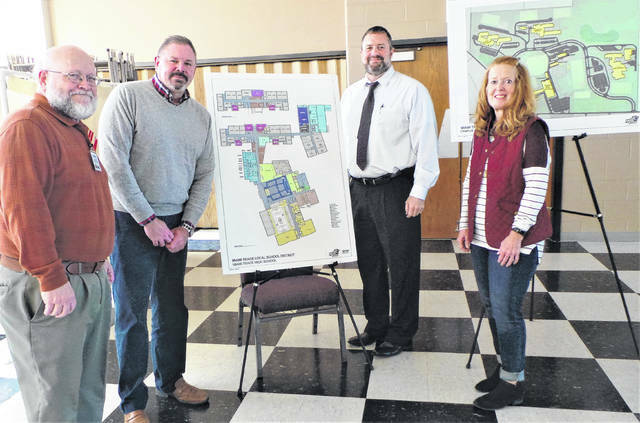 Pictured with detailed diagrams of the under-construction Miami Trace High School and of the entire centralized campus are (from left) new FCRTA member Richard Owens, MT Business Director Bill Franke, MT Superintendent David Lewis and new FCRTA member Barbara Garringer.